I do most of my reading during the long flights to and from the USA. 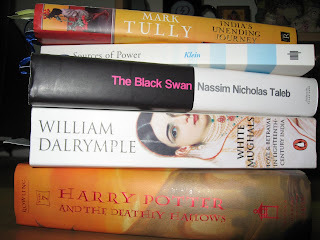 In recent posts I wrote about Dalrymple's fascinating White Mughals and Anthony Bourdain's absorbing Kitchen Confidential. I recently completed reading Harry Potter and the Deathly Hallows. I was half-expecting Deathly Hallows to be a damp squib given the big expectations, but I must say Rowling did a great job. The book brings back Dobby, Gringotts, Dementors, the flying motorbike, poly-juice potion, Kreacher, the Burrow and so many other characters and locations from the earlier books. Fast paced for the most part, the book begins with a bang and the (much speculated) ending didn't disappoint either; the only part where my interest began flagging was when Harry and his friends kept hopping from tent to tent looking aimlessly for horcruxes. The thing I liked most in this book was how well Rowling handled Snape's character and story. I am now in the middle of Nassim Taleb's Black Swan. Tabeb underlines how improbable and unpredictable events have shaped the world, from the rise of religions, 9/11, to events in our personal lives. He points out that we have a habit of fooling ourselves that we can reasonably predict the future based on events from the past, when we actually cannot. So far, his ideas are fascinating and refreshingly original, but the book is a little extreme at places and heavy on sarcasm in others. Update (Aug 14): Other interesting ideas as I continue to read Black Swan: Things, as we know, are all too often discovered by accident. Most of our current technologies are not used in the way their inventors intended them to be. Therefore, Taleb contends, trial-and-error leads to more innovative discoveries than directed research does. And more interestingly he says, humans are better at doing than understanding, and better at tinkering than inventing. But we don't know it (or accept the fact!). Taleb also talks about scalable and non-scalable jobs. Scalable jobs are those where the work you need to do (input) is directly proportional to your success (output). Example, a baker will have to bake as many more loaves of bread as his customer base goes up. Non-scalable jobs, on the other hand, do not require you to do more work when you become more successful. Example, an actor or a pop star, act/sing the same number of times irrespective of how many people see/hear their work. While many aspire for a scalable job for obvious reasons, chances of success are remote and unpredictable. And for those who are wondering, the Black Swan of the title comes from the idea that you can't confirm a statement like "all swans are white" by observing white swans. Just as you can't prove that OJ Simpson is not a murderer by closely observing him all day for a year and seeing him murder nobody. I totally agree on the Deathly Hallows review... She has done a terrific job tieing all the pieces together.... especially Snape's story... and I too got a little bored with the whole Horcrux hunt. I need to check out the other books. His is one show I watch unfailingly or TVo. @sig: But sadly it all ends now. @sakshi: I loved Bourdain's Kitchen Confidential. Now gotta read Buford's Heat which again takes me to restaurant kitchens, but this time Italian cooking! I agree with Sakshi, Bourdain's TV series No Reservations is great. It's a terrific combo of travel and food, topped off with Bourdain's sardonic comments. @filmholic: For some reason I have not been able to find this on my TV programming here. Need to see if it's available on DVD.